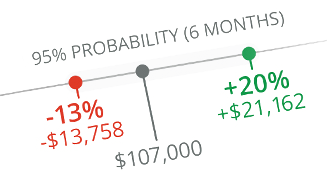 If there’s a common question that advisors raise when they first see Riskalyze, it’s this: why do you measure a client’s comfort zone and a portfolio’s 95% Probability Range using a six-month timeframe? Our entire thesis as a company is that investing a client in alignment with their Risk Number will empower them to be fearless investors and stay invested for the long term, delivering better results in the end. We chose the six-month timeframe because all of our research pointed to a simple truth: while investors should be focused on the long term, they react to risk in the short term, and emotional reactions to risk are the number one killers of long-term financial goals and results. Let’s tackle a few of the most common questions and fears about the six-month range. Q: Won’t the six-month range cause the client to be reactive and nearsighted about their portfolio? I’ve been trying to get them to think long-term. A: If you use the 95% Probability Range to promise performance — something no advisor should do! — that might be a problem. But the idea is to use the analytic to give the client some semblance of what “normal” is for the portfolio you’ve built for them, and set expectations you can consistently achieve. Q: Why not one year? Isn’t everything else we do in our industry on an annual basis? A: Riskalyze incorporates decades of behavioral economics research, and everything we’ve seen and experienced ourselves has confirmed that one year is just too long for a client to “hang in there” if they are in the midst of volatile markets and worried about their downside risk. These clients need a shorter timeframe than one year to keep them invested for the long term. Q: I don’t think it’s important for the client to know a six-month probability range for their portfolio. They should just see that this portfolio leads to retirement in 20 years and that should be good enough. A: It is said that a journey of a thousand miles begins with one step, but it’s also true that nobody invests for twenty years towards retirement. Psychologically, your clients are investing for a large number of much shorter time periods. And the short term decisions they make along the way will have a profound long term impact. Put another way, one cannot travel to a destination without knowing where they are starting from, and how they’re going to get there. What good is an itinerary from Los Angeles to New York without the knowledge that the traveler is psychologically unable to board an airplane? Far too many advisors respond to that kind of client by effectively saying “look, everybody flies and you’ll just need to get on the plane.” Effective advisors are able to show the client their tradeoffs. Traveling to New York by train is possible; it’ll just take a lot longer to get there. Or perhaps the client can proactively accept more risk than they wanted. Either way, you’ve now created invaluable alignment between you, your client and their portfolio. As one advisor put it recently, “Riskalyze informs today’s decisions within the context of a long term plan.” Join the movement and turn your clients into fearless investors — we’d love to help.